I have just completed a six week puppy school. Well, with Beau. Half the time we learnt things that Beau already knew. Sit. Lie down. Then we leant things that I already knew. How to brush your dog. How to check for fleas. But we did other things too, like 'stay' and walking on a lead and recalls. Beau loved it as he got to meet loads of people, who love him, and lots of other dogs, who he loves. Plus, it usually tired him out for the evening. Bonus. 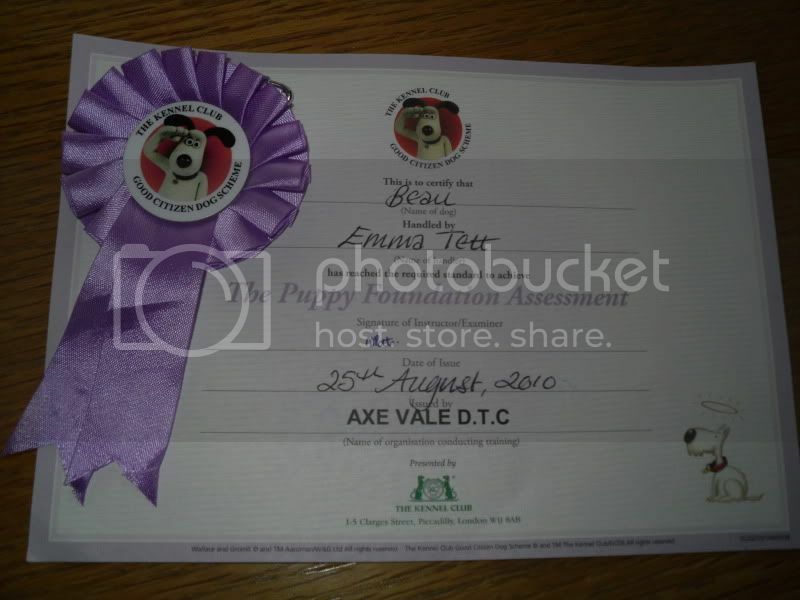 Anyway, we passed and have a little rosette and certificate to prove it. Beau is now a good dog citizen, according to the Kennel Club. Still can't stop the little bugger from sleeping on the sofa though. if the worst thing he does is sleep on the couch, you're doing all right! My dogs are mostly ok now but it was a long hard road to getting them there, we learned most things the hard way!